Full of anxiety on Wednesday, I cautiously headed out again to see if the leg was better and trail-worthy. I was also worried if I would know a soul or have to meet all new hikers over the next few days. As far as I can tell, the leg is at 95% again! PTL! Of course, the law of the trail: when one thing stops hurting, something else starts. I’ve had to pace myself to keep my knees happy with me. Before Wednesday I had taken 11 of the previous 15 days as Zeros, so these first days back almost feel like I’m starting all over again. As far as friends, I’ve seen somebody I know every day! The trail is a small world and has a way of evening out everyone’s pace. Just so you know, I’m undergoing an experiement tomorrow, one that I’ve thought about long before the hike began. Like I mentioned in the intro videos to the site I know that 26,000 children die a day from preventable causes related to their poverty, but I don’t know what 26,000 of something feels or looks like. So, tomorrow while hiking I’m going to count 26,000 steps, understanding that each step will represent a life ended too soon because of a very simple lack. The world has the resources — where are they going? 5/29 14.6 miles, saw my first turtle! Many portions of the trail were a river because of how much it rained last night. 5/30 22.8 miles, thankful leg doesn’t hurt! Saw a deer. Might have seen a bear. Saw 2 owls sitting together! 5/31 13.6 miles, challenging climbs and rock scrambles. Had dinner at an AYCE (all you can eat) Family Style restaurant….amazing! Welcome to my blog, fellow Franklinites and Williamson County residents! If you’re here, you probably read about me online or in the Herald. I’m so glad you’re here. Please make yourself comfortable; muddy shoes are welcome. Be sure to visit the Sponsorship link. That’s the heart of the hike. I really would love to see 2,200 kids sponsored by the time I reach the top of Mt. Katahdin. Please consider how you can be part of one child’s life. Thanks for coming by! There’s more to come, so sign up for the updates to find out if I make it. P.S. If you’d like information about my motorcycle, it’s a 2002 Suzuki DR-Z400S with 4,600+ miles. It’s in excellent condition. Email 2002suzukidrz400s (at) gmail (dot) com for pictures and pricing. So after feeling the need to take several days off in a row rather than walking a day then resting a day, last Wednesday (5/20), after only 12.5 miles, I decided to take several days off and spend time “resting.” My rest was in the form of a road trip into Baltimore from Saturday-Tuesday to attend the “This Is Next” conference. 1 hiker friend, 1 camp ministry friend, 3 college friends, 10 church friends, and 1 pastor friend plus 4 Iced-venti Vanilla Breve Starbucks Doubleshots, 1 Chipotle burrito, and a hotel bed were my temporal highlights of being in Baltimore. Jesus’ life, work, death, resurrection, and return were the focus of the weekend. If you don’t know who Jesus is, it would be a great way for you to spend some time getting to know Him by listening to the audio that will be available free from the Resources section of their website. If you do know Him, it would be a great way to spend some time reminding yourself! The teaching was top quality. So, how does my leg feel? I don’t know. I don’t feel like I’ll know until I get out there today and try some miles. It hurt less and less as the weekend progressed, but it was still noticable after a day of minimal walking. So, how do I feel about the hike? Well, after the amount of teaching I heard this weekend, I feel like I have a lot of things to process and what better way to do so than in the silence of the woods. But…this is one of those days on the Appalachian Trail that this hiker doesn’t feel like hiking. Could have something to do with the rain, the uncertainty of whether or not my leg is better, how great it was to be around friends all weekend, that I had a ride back to Ohio or Nashville, the uncertainty of good, better, and the best decisions, or how I miss playing piano and being involved in music. Maybe I tend to be a moodier hiker than everyone else out here. 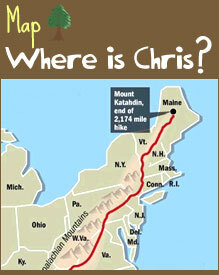 Again, I feel like this is relevant material for those of you who would ever consider a long distance hike. You can think of 1,000 reasons why it’s a good idea to attempt a long distance hike. But on the tough days, only a few reasons are enough to tempt you to end the hike. However, I feel like there is work to be done; work to be done in me through the teaching I’ve heard and continue to carry in my head. And work to be done to fulfill more of the goals of this journey and hike. So, today, I hike. Thanks again for reading. I probably would have quit a long time ago if it hadn’t been for the kind things and encouragement I receive from y’all! 5/22-5/26 Nero’s in Pearisburg and Baltimore. Still had to walk to places like the library, the conference center, meals, Starbucks, etc. But no pack on the back for those walks.